Ex-Southampton, Derby County and Leicester City midfielder Matt Oakley has featured in 12 different Premier League seasons and as he brings his assured nous to Exeter City’s promotion challenge he has found that it is not only his on-field contribution that has taken on a decidedly seasoned edge in recent times! Matt has had some noteworthy moments in his career to date, including captaining Derby County to Championship play-off success, leading Leicester City to the League One title and playing the whole of the 2003 FA Cup final with Southampton. His debut in professional football came as a substitute for Simon Charlton in Southampton’s goalless draw with Everton in May 1995 and the Peterborough-born midfield campaigner was still 17 at the time. This season he has been one of the central figures for Paul Tisdale’s Exeter side as they bid to return to League One at the first attempt, and for Matt, things have altered somewhat since he was that teenager making his way in the game, including when it comes to his music. He was named by his former Derby teammate Michael Johnson during his interview on here last year as one of those in charge of the Rams’ changing room sound choices and Matt described his playlist preferences and how they have changed in more recent times, to his slight horror! “I like a wide range of music now that I am getting older and embarrassingly I have started to listen to stuff that my Mum and Dad would play when I was growing up. At school it was dance stuff then into Stereophonics and The Verve and Oasis. While Matt may be one of the elder statesmen in the Exeter squad at 35 he is certainly not alone, with the likes of Jamie Cureton, 37, Tommy Doherty, 33, Steve Tully, 32, and Danny Coles, 31, who gave his own interview on here around this time last year. That said, there is nothing quite like harking back to the early days of your music collection to get the nostalgia flowing, as well as a distinct feeling of ‘where did those years go?’! It is a sentiment that Matt would appear to agree with when you hear his response to the question of the first record he ever had. 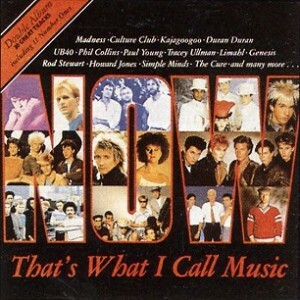 Matt has already mentioned the transition that his music taste has been subjected to over the years and that seems most definitely true when you consider that the ‘Now’ album he used to listen to features the likes of KC & The Sunshine Band’s ‘Give It Up’ and ‘Down Under’ by Men At Work! He is someone who has spent a lot of time in the Midlands thanks to his stays with both Derby and Leicester and this allowed him the opportunity of witnessing an array of live performances, including one from Leicester’s most renowned band since Showaddywaddy! Although Matt used to provide the dance music at Derby along with Michael Johnson and Steve Howard he has not yet managed to prise that honour away from the current player in charge at Exeter, a former Swindon Town defender and Bristol City youngster. Although Matt’s early experiences as a top flight player came under firstly the late Alan Ball and then Dave Merrington it was during Graeme Souness’ managerial tenure at The Dell that he would establish himself as a regular. His name would largely continue to be a fixture on Saints teamsheets under Dave Jones, Glenn Hoddle and Stuart Gray. In the 2002/03 season Gordon Strachan’s Saints went all the way to the FA Cup final and Matt was a mainstay as he played in every round, scoring twice in a 2-1 win at Millwall in the fourth round replay. The team were beaten at The Millennium Stadium in the final by Arsenal as Robert Pires’ first-half strike was enough to settle the game but Matt was on the field for the entirety. Matt had to contend with significant injury trouble as knee ligament damage suffered in the autumn of 2003 kept him out of action until Boxing Day 2004. The Saints were relegated from the Premier League in May 2005 and Matt, who had scored in an FA Cup win over rivals Portsmouth and a 4-3 league success over Norwich, was an onlooker from the bench as Harry Redknapp’s side lost their top flight status. 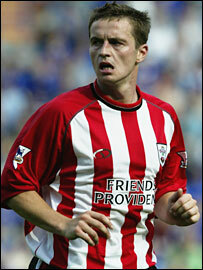 His time at Southampton ended in 2006 as he departed St. Mary’s to join Championship rivals Derby who were now under the management of Billy Davies. The Saints were his first club though and he has spent the bulk of his footballing life with the South Coast outfit, enjoying numerous memories along the way. He shared a changing room with some considerable personalities during this time, some of whom he will name later in his 5-a-side team selection of the best he has worked with, and music would play a part in youth meeting experience! “(I have had to) sing and dance on many occasions. At Southampton it was always the chance for the apprentices to get their own back at the pros and to put on a performance. As he has worked under the stewardship of managers including Ian Holloway, Gordon Strachan and the ex-England midfielder and part-time singer Glenn Hoddle, has Matt ever witnessed any of them getting involved with the team’s pre-game music? After leaving Southampton, Matt was captain of the Derby team that won promotion to the Premier League in 2007, his and manager Billy Davies’ first campaign at Pride Park. The feat was secured with a 1-0 win over pre-season promotion favourites West Brom at Wembley in the Championship play-off final with Matt turning in an outstanding performance. He netted the Rams’ first goal back in the Premier League as the team drew 2-2 with Portsmouth at home but it was a miserable season for the club who were relegated with a record low of 11 points. 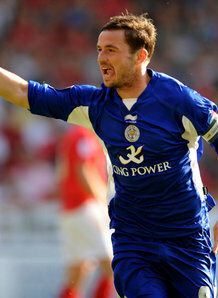 Matt had scored three times in the first few months but he joined Leicester in January 2008. Seth Johnson was cited by Michael Johnson on here as being the worst for music at Derby but Matt picked out one of the better ones, and it was another player (and a DJ when time allows) who has spoken to this site in recent times. Leicester were relegated from the Championship at the end of the 2007/08 season but would come storming back to win the League One title the following year under new boss Nigel Pearson. Matt was captain of the Foxes side that secured an instant return to the second tier and also weighed in with 8 goals from midfield. He would also feature regularly as they reached the Championship play-offs in 2009/10 and played a further 36 games in 2010/11. It was from this spell of his career that he saw what he rates as one of the most memorable singing performances from a teammate, as a festive tune quickly became a nightmare for an up-and-coming player! 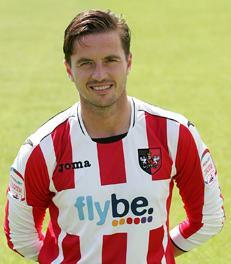 Last season saw Matt gain his first taste of life as an Exeter player as he joined the Grecians for a loan spell in October 2011 while the club were still in League One. Injury prompted his return to parent club Leicester a month later but he returned to St. James Park this summer on a permanent basis. After relegation to League Two last season Paul Tisdale is aiming for a return to League One, and he has the Devon club in the play-off places (7th) after 21 games. Matt is enjoying an extended run of football once again and with his top flight experience and a pair of promotions from higher divisions he is hopeful of adding a third when May comes around. “I feel very good having had a bad injury last year which I thought caused me some problems. Recovery is the toughest thing to deal with as you get older. The 15 goals of veteran marksman Jamie Cureton have caught the eye in the first half of 2012/13 and the team face struggling Plymouth Argyle in a Devon derby at home this Saturday. In the time he gets to spend away from football Matt has a couple of other ventures which could well prove fruitful for him beyond his playing days. The way I end the interviews on here is usually to get the player to name the 5-a-side team they would choose comprising of the best four teammates from their career who they would choose to play alongside them. Matt preferred to take a slightly altered perspective, and his team includes three colleagues chosen from his time at Southampton and a frontman who was with him for his success at both Derby and Leicester. “I have picked a team of people that have been close to me in my career. (Goalkeeper) Dave Beasant – a great guy and looked after me when I was starting in the game. “(Striker) Steve Howard – a good friend who I won promotions with, hard as nails too. Matt Le Tissier (midfielder/forward) – a good friend and absolute genius with the ball.